This is the Koenigsegg CCR. A true masterpiece in engineering and performance. A Swedish supercar. The CCR was first shown at the Geneva Auto Show in march 2004. It was a new, very exciting supercar with top of the line performance. 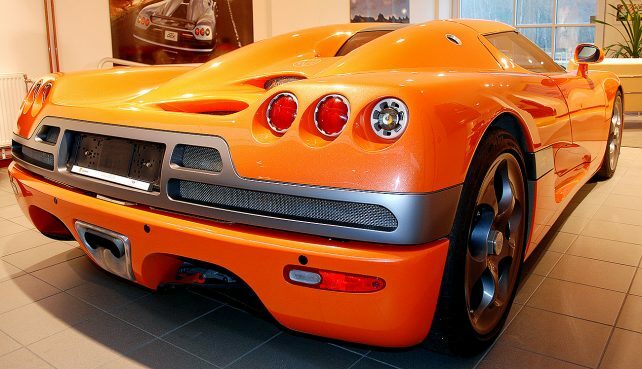 When I visited the Swedish sports car dealer and Koenigsegg reseller Callisma at their showroom in Stockholm in 2009, this car was the major star in the showroom. With its intensive orange paint, it sure looked amazing. I don’t remember how much Callisma asked for it, but I could probably sold one of my kidneys on the spot to afford it. You only need one, right? I recently checked the CCR´s retail price back in 2006. Back then, The CCR was priced at 570.000$. Looking back, a kidney (pickled or not) might have bought me a door handle and with a little luck maybe a Koenigsegg keyring. 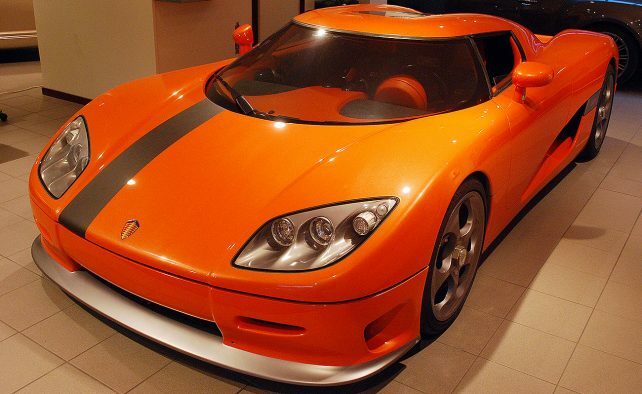 The CCR was definitely a better looking car than its predecessor, the Koenigsegg CC8S. Excellent paintwork, flawless interior, lots of creative details and a mesmerizing sound from the 4.6 liter Ford V8. To achieve 806 horsepower (600 kW) at 6900 rpm, the engine is equipped with twin Rotrex Superchargers. Maximum torque is 920 Nm, (680 lb·ft) at 5700 rpm. The CCR made some serious news the 28 February 2005. That day, Koenigsegg set the world speed record at the Nardo test track in Italy. Boy it was fast, it reached 241 mph (388 km/h). Not bad for a Swedish newcomer, it was not far from its claimed top speed of 245 mph (395 km/h). And it literally smashed the former record, of 231 mph (372 km/h) set in 1993 by the mighty McLaren F1. Impressive. And a proof that Koenigsegg was almost as fast as it was claimed to be. The CCR is fairly lightweight, weighing in at 1,180 kg (2,601 lb). Its monocoque weighs just 75 kilos (165 Ib), no wonder it sets of like a missile. 0-62 mph took just 3,2 seconds (remember this was back in 2006, a time before Godzilla’s and other supercars) and the acceleration didn’t stop. 0-200 km/h (124 mph) took 9.3 seconds. The sprint 0-300 km/h (186 mph) is finished in just 24.9 seconds. I was lucky to get a peek at the interior before I was given the full tour of the magnificent car. If I remember correct it was Fred Mannerfelt, who showed me the CCR when I arrived at the showroom an early morning. Excellent service, and there were several other nice cars to admire. Later that day I also visited the lemurs of Skansen Zoo. But the CCR was on my mind all that day. 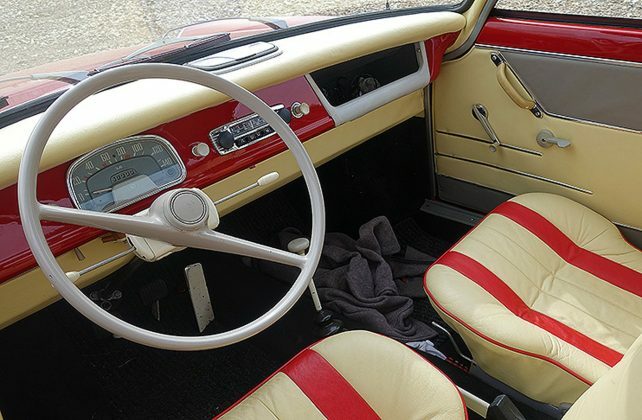 And it was an absolute joy to feel, and to have a look at the orange interior, the black seats with orange cross stitching and the big telephone like dial on the center console. There were Carbon fiber as long as the eye could see, and a thick steering wheel. Damn, did I want this car. In the workshop, Callisma also had a white Koenigsegg CCX (49 made in total), soon to be delivered to a happy owner. At the MPH-show in Stockholm in 2009 the white CCX, with Peter Sundfeldt behind the wheel scared the living daylights out of the audience when he suddenly revved it up, and let it roar. Koenigsegg made just 14 of these. Since then, the factory has taken a quantum leap in developement and offers some of the most advanced hypercars available. Insanely fast cars, like the Agera, Agera R, Agera RS, Regera and the remarkable Koenigsegg One:1. If you thought the CCR was quick, the One:1 is capable of 0–400 km/h (248 mph) in 20 sec. The top speed is bonkers, 432km/h (268 mph). It´s also very beautiful. At the end of the day, I still had a smile on my face. The lemurs at the zoo were nice and fun, but I think I dreamed about that car for days when I got home. I still do. I wonder what kind of roads it drives these days. Why don’t you visit the Koenigsegg homepage? Or perhaps you might want to visit Callisma AB for more exciting cars? Im also on DriveTribe. Follow this link and scroll down to see the posts. The first time I saw her, it was love at first sight. She was a tiny red BMW 700 Coupé. A small sports car, with a tiny engine. Although her small engine did sound pretty nice, in general she seemed to be in good condition. Someone had taken care of her. Despite the fact that she was made in Germany back in 1961. That’s a long time ago. Well, it’s time to start talking about her as a car. 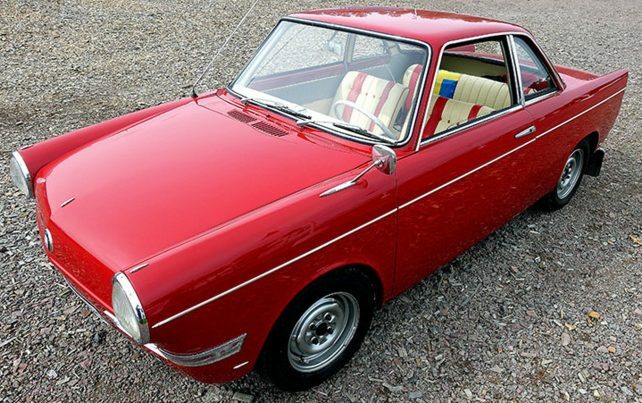 Of course, this BMW 700 Coupé has got some new parts and guessingly a whole lot of love during its 55 year life. And it has earned them. The 700 Coupé was designed by the now legendary Giovanni Michelotti, and it impressed a lot of potential buyers in early 1959 when they saw photos of BMW´s new replacement model for the tired old BMW 600. BMW 700 Coupé also seemed to fit as a race car. Not only as a daily driver. And it was a success on in rally’s and on the racetracks. The RS-model had an impressive 70 horsepower, and it was light, weighing just 1,323 lb. As you can see, the lines are very beautiful. Especially in red, with red and beige interior. The dashboard is just right patinated and contains only the absolute essentials. The seats are small and thin. The steering wheel as well, and its floor-mounted four-speed gear selector and the fully independent and improved suspension made it a fun car to drive. No wonder that the owner seemed to be very happy when he stepped out of the little car. The engine was a normally aspirated 697 cc (43 cui) twin cylinder petrol engine with carburetors and four valves. It was placed in the back and the car was had rear wheel drive. BMW had earlier used the engine in their motorcycles, but found it a perfect fit for the 700 Coupé. Is was available in either 30, 32 or 40 HP. However, 40 HP was only found in 700 Sport Coupe. 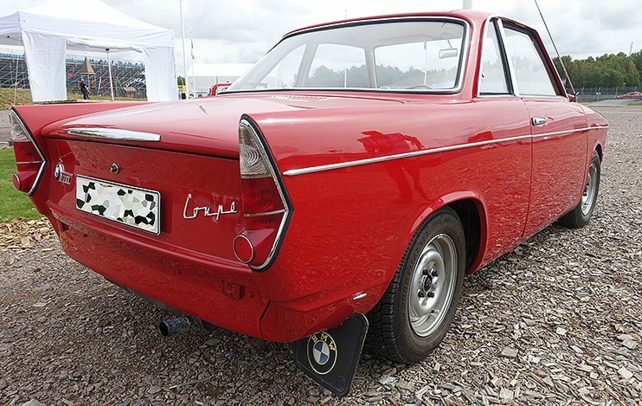 The car in this article is an ordinary BMW 700 Coupé. With 32 horsepower (24 Kw), it’s not a Ferrari competitor. But thanks to small dimensions, light weight (only 640 kilos) it actually was quite fast. And fun to drive. There is no problem to reach 70 mph/h. You just need to wait a little to get there, 0-60 took at least 32 seconds. But who cares about performance when it comes to this little beauty? It’s a little gem, and in fact the 700 saved BMW from bankruptcy when it was new. These days it’s a true and rare little car. It makes me glad when I see it. Although it’s a very rare sight. 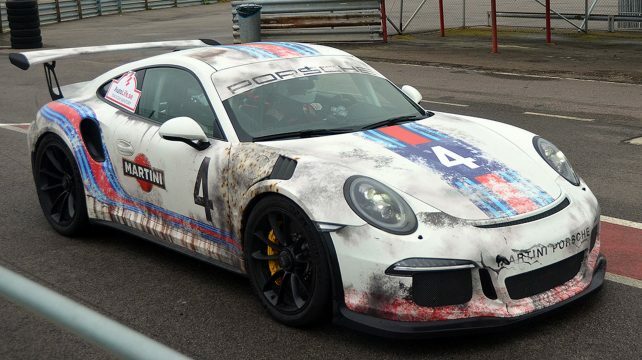 Porsche 911 GT3 RS – It´s a wrap! A standard Porsche 911 GT3 RS is not a boring car to look at. But this car has been given a very nice wrapping (designed by Skepple INC) by Swedish company Wrapzone. The patinated livery in the classic Martini Racing, with rust and scratches looks quite amazing. The owner, Henrik really pushed it to the limit on the Mantorp Park circuit at the annual track day arranged by Autolife. Unfortunately the rain poured down, but the drivers did not care at all. The 500 horses from its very impressive, naturally aspirated 4.0 liter engine give this “Internet celebrity ” Porsche ballistic performance. 0-100 km/h on 3,3 seconds, and 310 km/h flat out. What kind of car is this beast?